Currently, I am 35 weeks pregnant! Woohoo – almost there! And while I’ve been busy checking off my to-do list (prepare the nursery, register at the hospital, make a list of baby names, etc), it’s now time to also begin prepping my body for labor by drinking daily a prenatal Chinese date tea made with red dates, goji berries, longans and astralangus. 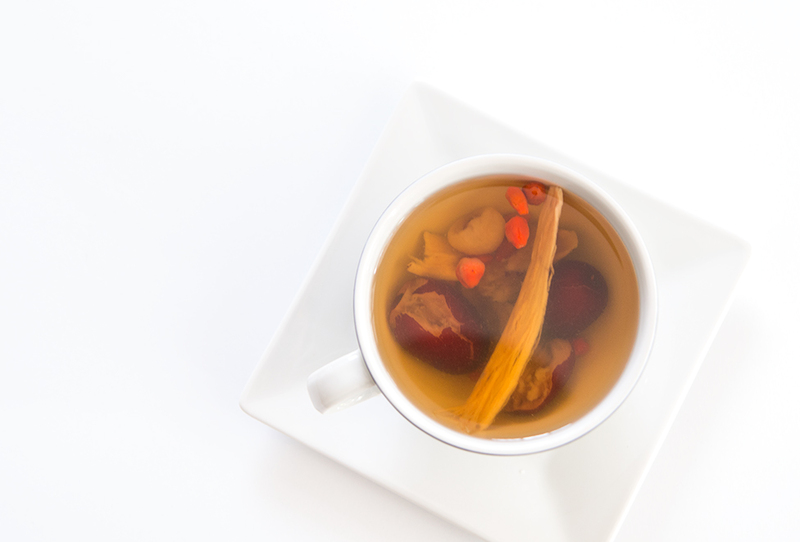 This herbal tea contains many components routinely used in Traditional Chinese Medicine, such as Chinese red dates (jujube), goji berries, astralangus membranaceous and dried longan, for their qi enhancing qualities. I was instructed to begin drinking this tea and eat 5-6 steamed dates every day beginning at 35-36 weeks prenatal by our postpartum Chinese nurse (more on this later), to help prepare my body for labor in a few ways: improve circulation, support the kidneys and liver, and the most important aspect – soften the cervix, which will allow for an easier labor process. I was skeptical at first, but when I began researching online, I found a very interesting study published in 2011 in the Journal of Obstetrics and Gynecology whose findings support the touted benefits of eating dates to prepare for labor. In the study, one group of women consumed six date fruits per day for four weeks prior to their estimated due date compared to a second group that consumed none. The results: the women who consumed the date fruits had significantly higher cervical dilation upon admission to the hospital; had shorter latent phases of labor (aka shorter first phase of labor); had a higher outcome for spontaneous labor (aka no interventions) and significantly lower need for drug intervention with prostin/oxytocin. Overall the study concluded that the consumption of date fruits continuously for four weeks before your due date can significantly reduce the need for induction during labor and produced a slightly more favorable delivery outcome. The study I referred to above used regular mejool dates you can buy at any grocery store, but our Chinese postpartum nurse insisted I use Chinese jujube dates since they contain less sugar. I think either would be fine. See below for the tea ingredients, their benefits and the tea recipe. Used widely in Chinese medicine for thousands of years due to its high nutritional and antioxidant content, the jujube is high in vitamin C, phenolics, and flavonoids. Recent studies have reported this fruit to have strong anti-inflammatory, circulatory and gastrointestinal protective benefits. This little berry is rich in vitamin C, A, zinc and iron, and contains all 8 essential amino acids. Goji berries have been found in a recent study to increase energy, improve sleep quality, focus and overall well being in clinical trials when a test group consumed them daily for 14-days compared to a control group. Astralangus is a perennial plant native to eastern Asia. The root has been used in Traditional Chinese Medicine for centuries combined with other Chinese herbs to strengthen the body against disease (Penn State Hershey Medical Center). Astralangus has antibacterial, anti-inflammatory and antioxidant properties. Studies have shown longan fruit used widely in Traditional Chinese Medicine to be a rich source of polyphenols, which exhibit antioxidant and anti-inflammatory benefits. Add all of the ingredients into a tea kettle or pot, and place over high heat. Once the water begins to boil turn the heat off and let steep. Do not boil for long; the high heat will reduce the vitamin C content of the ingredients. It’s best to allow the ingredients to steep in the hot water versus sit over a hot flame. Allow the tea to steep for 20-30 minutes; the longer the better. And enjoy! Flavor: this tea has a slightly sweet, rich fruity and floral flavor! Tips: place the hot tea in a large liter canister and allow to steep overnight, then enjoy throughout the next day. OR place in glass bottles and refrigerate – makes for a nice chilled, sweet tea drink. If you’re curious about the Chinese postpartum nurse I mentioned earlier, read this article explaining the “Month of Confinement” Chinese practice I will be doing postpartum to help with recovery after the birth of our baby girl that includes tips from our baby nurse for recovery after delivery.